We have trial access to Nineteenth Century Collections Online: British Politics and Society until the 27th February. Including papers of British statesmen, Home Office records, ordnance surveys, working class autobiographies, and other unique collections, British Politics and Society is a remarkable resource for scholars looking to explore the political and social history of Britain. Source libraries are the British Library, Oxford University, and The National Archives, Kew. This entry was posted in Trials and tagged Gale, Nineteenth Century Collections Online: British Politics and Society on January 30, 2015 by eresources. We have trial access to the Independent Digital Archive 1986-2012 until the 27th February. The Independent Digital Archive, 1986-2012 is a digital collection that covers the full run of the newspaper from its very first issue until the end of 2012. The archive includes The Independent on Sunday (1990-onwards) and editions from 2005 are available in full colour. This entry was posted in Trials and tagged Independent, Newspaper Archive on January 29, 2015 by eresources. We have trial access to Gregory of Nyssa Online (comprising Gregorii Nysseni Opera Online and Lexicon Gregorianum Online) until the 25th February. The Lexicon Gregorianum constitutes the most comprehensive Greek-German dictionary ever of the language used by Gregory of Nyssa. It is, and will be for the foreseeable future, the only dictionary available specifically addressing the vocabulary of late Classical Greek. This entry was posted in Trials and tagged Biblical studies, Classical Greek, Gregorii Nysseni Opera, Gregory of Nyssa, Lexicon Gregorianum on January 29, 2015 by eresources. Below is a list of our recent new e-journal subscriptions. These titles can be accessed from our E-Journals Page now and via our catalogue and Searcher next week following system updates. This entry was posted in New e-resources and tagged e-journals on January 28, 2015 by eresources. 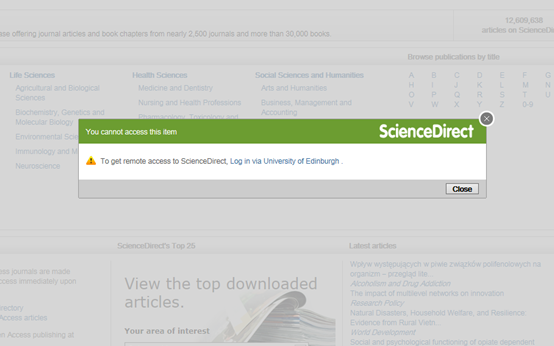 ScienceDirect is currently producing an incorrect error message while on campus or off campus using EZProxy links. Click “close” to clear the error message and you should find access working correctly. This fault has been reported to ScienceDirect. This entry was posted in Access issues and tagged ebooks, ejournals, ScienceDirect on January 27, 2015 by eresources. We have trial access to the Macmillan Cabinet Papers 1957-1963 until the 19th February. Macmillan Cabinet Papers, 1957-1963 provides complete coverage of the Cabinet conclusions (minutes) (CAB 128) and memoranda (CAB 129) of Harold Macmillan’s government, plus selected minutes and memoranda of policy committees (CAB 134). Further information about the content can be found here. This entry was posted in Trials and tagged Adam Matthew, database, History, Macmillan Cabinet Papers, National Archives, politics on January 23, 2015 by eresources. We have trial access to Cambridge Archive Editions Online until the 20th February. Cambridge Archive Editions Online is an extensive collection of historical archive materials on the modern political development of the Arabian Peninsula and the Persian Gulf, Russia and the Balkans, the Caucasus, Southeast Asia, and China and the Far East. The collection consists of over 1000 digitised books published by Cambridge University Press which can be accessed in full page images with searchable metadata. This resource is particularly rich for the study of boundary formation, claims and disputes. This entry was posted in Trials and tagged Cambridge Archive Editions Online, Cambridge University Press, Caucasus, e-books, EastView, Far East, History, Middle East, Russia and the Balkans, Southeast Asia on January 23, 2015 by eresources. Following a successful trial on the Wanfangdata platform, we now subscribe to China Local Gazetteers and China Economic Statistics. China Local Gazetteers is a collection of Chinese local gazetteers published after 1949, covering all regions of China. There are over 26,400 volumes of e-books included in this database which contain a range of information covering various aspects of local economic, social and political life. China Economic Statistics offers time-series records on macro-economic data, industry and sector data, regional data with over 10,000 economic indicators. Both e-resources have been added to our Databases A-Z list as well as the Economics and East Asian Studies A-Z subject lists. They will be listed on our catalogue and Searcher next week. This entry was posted in New e-resources and tagged China Economic Statistics, China Local Gazetteers, databases, e-books, economic indicators, industry and sector data, macro-economic data, regional data on January 23, 2015 by eresources. Following a successful trial, we now subscribe to ARAS: The Archive for Research in Archetypal Symbolism. The ARAS archive contains about 17,000 photographic images, each cross-indexed, and accompanied by scholarly commentary. The commentary includes a description of the image with a cultural history that serves to place it in its unique historical and geographical setting. Often it also includes an archetypal commentary that brings the image into focus for its modern psychological and symbolic meaning, as well as a bibliography for related reading and a glossary of technical terms. This online resource will be of particular interest to students and staff of Edinburgh College of Art, and the Schools of History, Classics and Archaeology, and Literature, Languages and Culture. It has been added to our database A-Z list, several subject A-Z lists, our catalogue and Searcher. Further information about our databases can be found at http://www.ed.ac.uk/schools-departments/information-services/library-museum-gallery/finding-resources/library-databases. This entry was posted in New e-resources and tagged ARAS, Archive for Research in Archetypal Symbolism, photographic images on January 22, 2015 by eresources.